The Manual Ink Maintenance function performs ink maintenance when it is required on the Direct Jet 1024UVMVP. The Color Byte RIP should be set to automatically prompt the user, prior to sending a print job, if it is necessary to perform this function. If manual ink maintenance is required, it must be performed prior to printing. Any user who has installed an MVP device into Color Byte RIP 9.1 Build 3 prior to May 12th, 2014 will need to update their license files via the RIP and manually turn this dialog box ON. All license files issued after May 12th, 2014 will have this option defaulted to ON. Note: This is only for the 1024UVMVP Device in Color Byte RIP 9.1 Build 3. Download a printable PDF of this Tech Tip. All Port Settings have default timeouts. If these timeouts are left at the default value, the user will have a smaller window to perform ink maintenance before a print job. 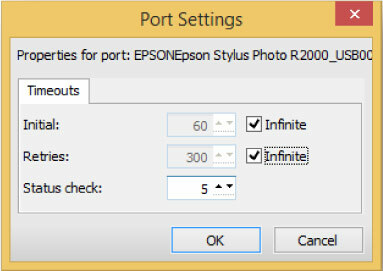 To ensure the maximum time is allotted, the port settings should be changed to Infinite. Note: This will have to be done for all Queues separately. Also, if the port number changes, from ...004 to ...005 for example, the port settings will need to be adjusted. Every time a print job is sent, the RIP will check the printer to decide whether manual ink maintenance will be required. If it is determined that a manual ink maintenance process will need to be performed during a print job, the dialog box below will appear. Before hitting OK, go to the LCD Touch Screen on the printer and perform the Manual Ink Maintenance. When the process is complete, there will be a solid Green Light and the #1 or #2 error light WILL NOT be lit on the Manual Ink Maintenance screen. Select OK from the Printer Status Alert dialog box. The printer will perform a light head cleaning and then begin printing the job.